Much of this erosion occurs as the weakened banks fail in large slumps. Thermal erosion also affects the Arctic coast, where wave action and near-shore temperatures combine to undercut permafrost bluffs along the shoreline and cause them to fail. Annual erosion rates along a 100-公里（62-英里） segment of the Beaufort Sea shoreline averaged 5.6米（18英尺） per year from 1955 to 2002. ^ 1.0 1.1 Blanco, Humberto & Lal, Rattan. Soil and water conservation. Principles of Soil Conservation and Management. Springer. 2010: 2. ISBN 978-90-481-8529-0. ^ 2.0 2.1 Toy, Terrence J.; 等. Soil Erosion: Processes, Prediction, Measurement, and Control. John Wiley & Sons. 2002: 1. ISBN 978-0-471-38369-7. ^ Julien, Pierre Y. Erosion and Sedimentation. Cambridge University. (Press. 2010: 1. ISBN 978-0-521-53737-7. ^ Toy, Terrence J.; 等. Soil Erosion: Processes, Prediction, Measurement, and Control. John Wiley & Sons. 2002: 60–61. ISBN 978-0-471-38369-7. ^ Zachar, Dušan. Classification of soil erosion. Soil Erosion. Vol. 10. Elsevier. 1982: 48. ISBN 978-0-444-99725-8. ^ See figure 4 in Obreschkow. Confined Shocks inside Isolated Liquid Volumes – A New Path of Erosion?. Physics of Fluids. 2011. arXiv:1109.3175. ^ 8.0 8.1 Food and Agriculture Organization. Types of erosion damage. Soil Erosion by Water: Some Measures for Its Control on Cultivated Lands. United Nations. 1965: 23–25. ISBN 978-92-5-100474-6. ^ Nearing, M.A. ; Norton, L.D. ; Bulgakov, D.A. ; Larionov, G.A. ; West, L.T. ; Dontsova, K.M. Hydraulics and erosion in eroding rills. Water Resources Research. 1997, 33 (4): 865–876. Bibcode:1997WRR....33..865N. doi:10.1029/97wr00013. ^ Poesen, Jean; 等. Gully erosion in Europe. (编) Boardman, John; Poesen, Jean. Soil Erosion in Europe. John Wiley & Sons. 2007: 516–519. ISBN 978-0-470-85911-7. ^ Poesen, Jean; 等. Gully erosion in dryland environments. (编) Bull, Louise J.; Kirby, M.J. Dryland Rivers: Hydrology and Geomorphology of Semi-Arid Channels. John Wiley & Sons. 2002. ISBN 978-0-471-49123-1. ^ Borah, Deva K.; 等. Watershed sediment yield. (编) Garcia, Marcelo H. Sedimentation Engineering: Processes, Measurements, Modeling, and Practice. ASCE Publishing. 2008: 828. ISBN 978-0-7844-0814-8. ^ Nancy D. Gordon. Erosion and Scour. Stream hydrology: an introduction for ecologists. 2004-06-01. ISBN 978-0-470-84357-4. ^ Thermal Erosion. NSIDC Glossary. National Snow and Ice Data Center. [21 December 2009]. （原始内容存档于2010-11-19）. ^ Costard, F.; Dupeyrat, L.; Gautier, E.; Carey-Gailhardis, E. Fluvial thermal erosion investigations along a rapidly eroding river bank: application to the Lena River (central Siberia). Earth Surface Processes and Landforms. 2003, 28 (12): 1349–1359. Bibcode:2003ESPL...28.1349C. doi:10.1002/esp.592. ^ Jones, B.M. ; Hinkel, K.M. ; Arp, C.D. ; Eisner, W.R. Modern Erosion Rates and Loss of Coastal Features and Sites, Beaufort Sea Coastline, Alaska. Arctic (Arctic Institute of North America). 2008, 61 (4): 361–372. doi:10.14430/arctic44. （原始内容存档于2013-05-17）. ^ See, for example: Alt, David. Glacial Lake Missoula & its Humongous Floods. Mountain Press. 2001. ISBN 978-0-87842-415-3. ^ Zheng, Xiaojing & Huang, Ning. Mechanics of Wind-Blown Sand Movements. Springer. 2009: 7–8. ISBN 978-3-540-88253-4. ^ Cornelis, Wim S. Hydroclimatology of wind erosion in arid and semi-arid environments. (编) D'Odorico, Paolo; Porporato, Amilcare. Dryland Ecohydrology. Springer. 2006: 141. ISBN 978-1-4020-4261-4. ^ Blanco, Humberto & Lal, Rattan. Wind erosion. Principles of Soil Conservation and Management. Springer. 2010: 56–57. ISBN 978-90-481-8529-0. ^ Balba, A. Monem. 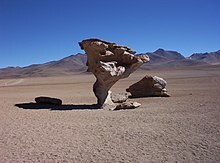 Desertification: Wind erosion. Management of Problem Soils in Arid Ecosystems. CRC Press. 1995: 214. ISBN 978-0-87371-811-0. ^ Wiggs, Giles F.S. Geomorphological hazards in drylands. (编) Thomas, David S.G. Arid Zone Geomorphology: Process, Form and Change in Drylands. John Wiley & Sons. 2011: 588. ISBN 978-0-470-71076-0. ^ Van Beek, Rens. Hillside processes: mass wasting, slope stability, and erosion. (编) Norris, Joanne E.; 等. Slope Stability and Erosion Control: Ecotechnological Solutions. Springer. 2008. ISBN 978-1-4020-6675-7. ^ Gray, Donald H. & Sotir, Robbin B. Surficial erosion and mass movement. Biotechnical and Soil Bioengineering Slope Stabilization: A Practical Guide for Erosion Control. John Wiley & Sons. 1996: 20. ISBN 978-0-471-04978-4. ^ Nichols, Gary. Sedimentology and Stratigraphy. John Wiley & Sons. 2009: 93. ISBN 978-1-4051-9379-5. ^ Blanco, Humberto & Lal, Rattan. Water erosion. Principles of Soil Conservation and Management. Springer. 2010: 29–31. ISBN 978-90-481-8529-0. ^ Mirsal, Ibrahim A. Soil degradation. Soil Pollution: Origin, Monitoring & Remediation. Springer. 2008: 100. ISBN 978-3-540-70775-2. ^ 30.0 30.1 30.2 Blanco, Humberto & Lal, Rattan. Water erosion. Principles of Soil Conservation and Management. Springer. 2010: 29. ISBN 978-90-481-8529-0. ^ Torri, D. Slope, aspect and surface storage. (编) Agassi, Menachem. Soil Erosion, Conservation, and Rehabilitation. CRC Press. 1996: 95. ISBN 978-0-8247-8984-8. ^ Styczen, M.E. & Morgan, R.P.C. Engineering properties of vegetation. (编) Morgan, R.P.C. & Rickson, R. Jane. Slope Stabilization and Erosion Control: A Bioengineering Approach. Taylor & Francis. 1995. ISBN 978-0-419-15630-7. ^ Whisenant, Steve G. Terrestrial systems. (编) Perrow Michael R.; Davy, Anthony J. Handbook of Ecological Restoration: Principles of Restoration. Cambridge University Press. 2008: 89. ISBN 978-0-521-04983-2. ^ Blanco, Humberto & Lal, Rattan. Water erosion. Principles of Soil Conservation and Management. Springer. 2010: 28–30. ISBN 978-90-481-8529-0. ^ Wainwright, John & Brazier, Richard E. Slope systems. (编) Thomas, David S.G. Arid Zone Geomorphology: Process, Form and Change in Drylands. John Wiley & Sons. 2011. ISBN 978-0-470-71076-0. ^ Committee on 21st Century Systems Agriculture. Toward Sustainable Agricultural Systems in the 21st Century. National Academies Press. 2010. ISBN 978-0-309-14896-2. ^ Blanco, Humberto & Lal, Rattan. 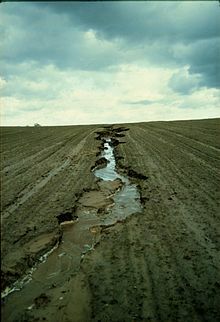 Tillage erosion. Principles of Soil Conservation and Management. Springer. 2010. ISBN 978-90-481-8529-0. ^ Lobb, D.A. Soil movement by tillage and other agricultural activities. (编) Jorgenson, Sven E. Applications in Ecological Engineering. Academic Press. 2009. ISBN 978-0-444-53448-4. ^ Poirier, S.-C.; Whalen, J.K.; Michaud, A.R. Bioavailable phosphorus in fine-sized sediments transported from agricultural fields. Soil Science Society of America Journal. 2012, 76 (1): 258–267. doi:10.2136/sssaj2010.0441. ^ Scalenghe, R.; Edwards, A.C. & Barberis, E. Phosphorus loss in overfertilized soils: The selective P partitioning and redistribution between particle size separates. European Journal of Agronomy. 2007, 27 (11): 72–80. doi:10.1016/j.eja.2007.02.002. ^ Whitford, Walter G. Wind and water processes. Ecology of Desert Systems. Academic Press. 2002: 65. ISBN 978-0-12-747261-4. ^ Imeson, Anton. Human impact on degradation processes. Desertification, Land Degradation and Sustainability. John Wiley & Sons. 2012: 165. ISBN 978-1-119-97776-6. ^ 43.0 43.1 Sands, Roger. The environmental value of forests. Forestry in a Global Context. CABI. 2005: 74–75. ISBN 978-0-85199-089-7. ^ 45.0 45.1 Goudie, Andrew. The human impact on the soil. The Human Impact on the Natural Environment. MIT Press. 2000: 188. ISBN 978-0-262-57138-8. ^ Stuart, Gordon W. & Edwards, Pamela J. Concepts about forests and water. Northern Journal of Applied Forestry. 2006, 23 (1). ^ Goudie, Andrew. The human impact on the soil. The Human Impact on the Natural Environment. MIT Press. 2000: 196–197. ISBN 978-0-262-57138-8. ^ Nîr, Dov. Man, a Geomorphological Agent: An Introduction to Anthropic Geomorphology. Springer. 1983: 121–122. ISBN 978-90-277-1401-5. ^ Randhir, Timothy O. Watershed Management: Issues and Approaches. IWA Publishing. 2007: 56. ISBN 978-1-84339-109-8. ^ James, William. Channel and habitat change downstream of urbanization. (编) Herricks, Edwin E.; Jenkins, Jackie R. Stormwater Runoff and Receiving Systems: Impact, Monitoring, and Assessment. CRC Press. 1995: 105. ISBN 978-1-56670-159-4. ^ Intergovernmental Panel on Climate Change (IPCC). Second Assessment Synthesis of Scientific-Technical Information relevant to interpreting Article 2 of the UN Framework Convention on Climate Change (PDF): 5. 1995. ^ Bicknell, Jane; 等 (编). Adapting Cities to Climate Change: Understanding and Addressing the Development Challenges. Earthscan. 2009: 114. ISBN 978-1-84407-745-8. ^ For an overview of other human activities that have increased coastal erosion rates, see: Goudie, Andrew. Accelerated coastal erosion. The Human Impact on the Natural Environment. MIT Press. 2000: 311. ISBN 978-0-262-57138-8. ^ Dangerfield, Whitney. The Mystery of Easter Island. Smithsonian Magazine. April 1, 2007. ^ Montgomery, David. Islands in time. Dirt: The Erosion of Civilizations 1st. University of California Press. October 2, 2008. ISBN 978-0-520-25806-8. ^ Zuazo, Victor H.D. & Pleguezuelo, Carmen R.R. Soil-erosion and runoff prevention by plant covers: a review. (编) Lichtfouse, Eric; 等. Sustainable agriculture. Springer. 2009: 785. ISBN 978-90-481-2665-1. ^ Sample, Ian. Global food crisis looms as climate change and population growth strip fertile land. The Guardian. August 30, 2007. ^ Smith, Kate & Edwards, Rob. 2008: The year of global food crisis. The Herald (Scotland). March 8, 2008. ^ Africa may be able to feed only 25% of its population by 2025. [2017-01-30]. （原始内容存档于2011-02-27）. ^ Potter, Kenneth W.; 等. Impacts of agriculture on aquatic ecosystems in the humid United States. (编) DeFries, Ruth S.; 等. Ecosystems And Land Use Change. American Geophysical Union. 2004: 34. ISBN 978-0-87590-418-4. ^ Da Cunha, L.V. Sustainable development of water resources. (编) Bau, João. Integrated Approaches to Water Pollution Problems: Proceedings of the International Symposium (SISIPPA) (Lisbon, Portugal 19–23 June 1989). Taylor & Francis. 1991: 12–13. ISBN 978-1-85166-659-1. ^ Merrington, Graham. Soil erosion. Agricultural Pollution: Environmental Problems and Practical Solutions. Taylor & Francis. 2002: 77–78. ISBN 978-0-419-21390-1. ^ Majewski, Michael S. & Capel, Paul D. Pesticides in the Atmosphere: Distribution, Trends, and Governing Factors. CRC Press. 1996: 121. ISBN 978-1-57504-004-2. ^ Science Daily. African Dust Called A Major Factor Affecting Southeast U.S. Air Quality. 1999-07-14 [2007-06-10]. ^ Nowell, Lisa H.; 等. Pesticides in Stream Sediment and Aquatic Biota: Distribution, Trends, and Governing Factors. CRC Press. 1999: 199. ISBN 978-1-56670-469-4. ^ Shao, Yaping. Wind-erosion and wind-erosion research. Physics and Modelling of Wind Erosion. Springer. 2008: 3. ISBN 978-1-4020-8894-0. ^ U. S. Geological Survey. Coral Mortality and African Dust. 2006 [2007-06-10]. ^ James K. B. Bishop; Russ E. Davis & Jeffrey T. Sherman. Robotic Observations of Dust Storm Enhancement of Carbon Biomass in the North Pacific. Science 298: 817–821. 2002 [2009-06-20]. （原始内容存档于2010-11-19）. ^ Evans, R. Assessment and monitoring of accelerated water erosion of cultivated land – when will reality be acknowledged?. Soil Use and Management. 2012, 29 (1): 105–118. doi:10.1111/sum.12010. ^ Blanco, Humberto & Lal, Rattan. Modeling water and wind erosion. Principles of Soil Conservation and Management. Springer. 2010. ISBN 978-90-481-8529-0. ^ See also: Shai, Yaping. Physics and Modelling of Wind Erosion. Springer. 2008. ISBN 978-1-4020-8894-0. and Harmon, Russell S. & Doe, William W. Landscape Erosion and Evolution Modeling. Springer. 2001. ISBN 978-0-306-46718-9. ^ Brazier, R.E. ; 等. Scaling soil erosion models in space and time. (编) Morgan, Royston P.C. ; Nearing, Mark. Handbook of Erosion Modelling. John Wiley & Sons. 2011: 100. ISBN 978-1-4051-9010-7. ^ Ward, Andrew D. & Trimble, Stanley W. Soil conservation and sediment budgets. Environmental Hydrology. CRC Press. 2004: 259. ISBN 978-1-56670-616-2. ^ Panagos, P.; Ballabio, C.; Borrelli, P.; Meusburger, K.; Klik, A.; Rousseva, S.; Tadic, M.P. ; Michaelides, S.; Hrabalíková, M.; Olsen, P.; Aalto, J.; Lakatos, M.; Rymszewicz, A.; Dumitrescu, A.; Beguería, S.; Alewell, C. Rainfall Erosivity in Europe. Sci Total Environ. 2015, 511: 801–814. doi:10.1016/j.scitotenv.2015.01.008. ^ Panagos, P.; Borrelli, P.; Meusburger. A New European Slope Length and Steepness Factor (LS-Factor) for Modeling Soil Erosion by Water. Geosciences, MDPI. 2015: 117–126. doi:10.3390/geosciences5020117. ^ Boardman, J.; Poesen, J. Soil erosion in Europe: major processes, causes and consequences. Soil Erosion in Europe. Wiley, Chichester. 2006: 479–487. ^ Jetten, V.; Favis-Mortlock, D. Modelling soil erosion in Europe. Soil Erosion in Europe. Wiley, Chichester. 2006: 695–716. ^ Favis-Mortlock, D. Validation of field-scale soil erosion models using common datasets. Modelling Soil Erosion by Water. Springer-Verlag NATO-ARS Series 1–55, Berlin. 1998: 89–128. ^ Jetten, V.; De Roo, A.P.J. ; Favis-Mortlock, D.T. Evaluation of field-scale and catchment scale soil erosion models. Catena. 1999, 37: 521–541. doi:10.1016/s0341-8162(99)00037-5. ^ Connor, David J.; 等. Crop Ecology: Productivity and Management in Agricultural Systems. Cambridge University Press. 2011: 351. ISBN 978-0-521-74403-4. ^ For an interesting archaeological/historical survey of terracing systems, see Treacy, John M. & Denevan, William M. The creation of cultivable land through terracing. (编) Miller, Naomi A. The Archaeology of Garden and Field. University of Pennsylvania Press. 1998. ISBN 978-0-8122-1641-7. ^ Forman, Richard T.T. Windbreaks, hedgerows, and woodland corridors. Land Mosaics: The Ecology of Landscapes and Regions. Cambridge University Press. 1995. ISBN 978-0-521-47980-6. ^ Johnson, R.J.; 等. Global perspectives on birds in agricultural landscapes. (编) Campbell, W. Bruce; Ortiz, Silvia Lopez. Integrating Agriculture, Conservation and Ecotourism: Examples from the Field. Springer. 2011: 76. ISBN 978-94-007-1308-6. ^ Udawatta, Ranjith P. & Shibu, Jose. Carbon sequestration potential of agroforestry practices in temperate North America. (编) Kumar, B. Mohan & Nair, P.K.R. Carbon Sequestration Potential of Agroforestry Systems: Opportunities and Challenges. Springer. 2011: 35–36. ISBN 978-94-007-1629-2. ^ Blanco, Humberto & Lal, Rattan. Wind erosion. Principles of Soil Conservation and Management. Springer. 2010: 69. ISBN 978-90-481-8529-0. ^ Nair, P.K.R. An Introduction to Agroforestry. Springer. 1993: 333–338. ISBN 978-0-7923-2135-4. ^ Lal, Rattan. Tillage Systems in the Tropics: Management Options and Sustainability Implications, Issue 71. Food and Agriculture Organization of the United Nations. 1995: 157–160. ISBN 978-92-5-103776-8. ^ See also: Gajri, P.R. ; 等. Tillage for sustainable cropping. Psychology Press. 2002. ISBN 978-1-56022-903-2. and Uri, Noel D. Conservation Tillage in United States Agriculture. Psychology Press. 1999. ISBN 978-1-56022-884-4. ^ Curran, W. Cover Crops for Conservation Tillage Methods. Penn State University. 2016 [December 1, 2016]. ^ Soil Management on Potato Land. Government of Manitoba. 2016 [December 1, 2016]. ^ The Advantages of the Fibrous Root & Taproot Systems. [2016-12-01]. Boardman, John; Poesen, Jean. Soil erosion in Europe. Wiley. 2006. ISBN 978-0-470-85910-0. Montgomery, David. Dirt: The Erosion of Civilizations 1st. University of California Press. October 2, 2008. ISBN 978-0-520-25806-8. Brown, Jason; Drake, Simon. Classic Erosion. Wiley. 2009. Vanoni, Vito A. (编). The nature of sedimentation problems. Sedimentation Engineering. ASCE Publications. ISBN 978-0-7844-0823-0.